A SpaceX Falcon 9 rocket lifts off with Israel's Lunar Lander and an Indonesian communications satellite at space launch complex 40, Feb. 21, 2019, in Cape Canaveral, Fla. An Israeli spacecraft blasted off to the moon in an attempt to make the country’s first lunar landing, following a launch Thursday night by SpaceX. 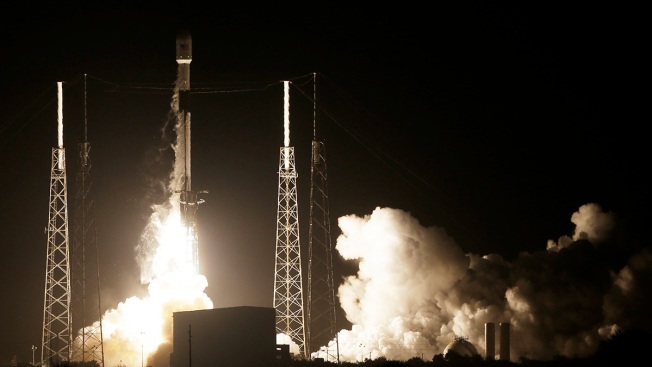 SpaceX launched another rocket Thursday, with some international cargo in tow. The Southern-California based aerospace company launched their Falcon 9 rocket Thursday at 5:45 p.m. PST from the Space Launch Complex 40 at Cape Canaveral Air Force Station, Florida. The purpose of the launch was to deploy the Nusantara Satu communication satellite, Indonesia’s first high-speed data satellite that will serve to improve internet connectivity in the region. The satellite will also be used for voice and data communications and video distribution throughout the Indonesian archipelago. Also on board the Falcon 9 was Israel's Beresheet — meaning Genesis or "in the beginning" in Hebrew — robotic lunar lander. The Beresheet lander will be the smallest spacecraft to ever land on the moon and would make Israel just the fourth country to successfully land on the moon, after Russia, the U.S. and China. Beresheet is Israel’s first spacecraft, and upon successful completion of its nearly two-month journey, it will become the world’s first privately-funded spacecraft to reach the lunar surface. The four-legged Beresheet, barely the size of a washing machine, will circle Earth in ever bigger loops until it's captured by lunar gravity and goes into orbit around the moon. Lunar touchdown would be April 11 at the Sea of Serenity. Its mission is to transmit photos and video of its new home and conduct scientific measurements. Beresheet will measure the magnetic field at the landing site, and send back data and pictures. A time capsule is aboard the lander — which includes a picture of Israeli astronaut Ilan Ramon, who died aboard space shuttle Columbia in 2003 — as well as a lunar library containing 30 million pages on a disk from the U.S.-based Arch Mission Foundation. Within an hour after liftoff, Beresheet was already sending back data and had successfully deployed its landing legs, according to SpaceIL. Thursday's launch of Falcon 9 also included the Air Force Research Laboratory S5 experimental small spacecraft, set to orbit the Earth for one year and demonstrate the capabilities of small-sized satellites. Deployments of the satellites and the lunar lander occurred approximately 33 and 44 minutes after liftoff.